With the digital revolution facing all industries, the number of options available to customers navigating problem-solving is staggering. The good news is that new tools like AI and machine learning are specifically designed to enable frictionless and personalized interactions. Inside, find out how your organization can make the best impression on customers by infusing AI, RPA and machine learning into your CX ecosystem. 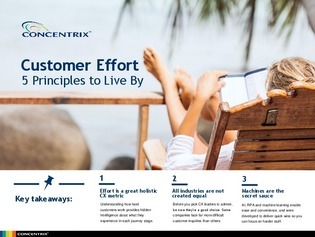 Explore 5 guiding principles to help embrace customer-centricity in your CX strategy.